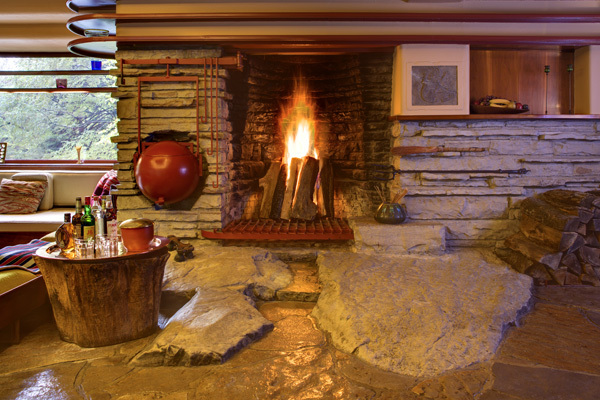 Frank Lloyd Wright's Fallingwater is 75 years old this year and its director, Lynda Waggoner, is celebrating with a sumptuous new book of essays and photography addressing the residence, its restoration and its landscape. During the home's 50th anniversary, Waggoner worked with photographer Christopher Little on a commemorative volume for Edgar Kaufman Jr., son of the original owner. She brought the artist back for the new project 25 years later. "I realized he has a great sensitivity to the property," she said. "The house can be a very intimate place, and he knows how to capture that." "It was such a treat to go back after 25 years," Little said. "They gave me a small house on the grounds for six weeks and during each season. I had run of the house." He opted for digital photography over film this time around. Once he'd got his lighting right, he mounted his camera on a tripod and shot one image at normal exposure, one overexposed and one underexposed. Then he melded all three together. "It's the closest you can get to what the eye sees," he said. "You still see the shadows and highlights, but your perception on a two-dimensional page is what your eyes see in three dimensions." Waggoner also invited author, landscape ethicist, and photographer Rick Darke to the property. He walked the land with her, looking over the property in all seasons and at all times of day for a chapter on its landscape. "She invited me out to stay in a cabin on Bear Run, and said to bring my wife and dog," Darke said. "It helped me frame the photography. And then, she asked me if I'd write the design chapter. I said: 'Twist my arm?'" The result is a chapter of prose and photos that need no captions; though they are included. His intent, the former curator for Longwood Gardens said, is narrative photography that can be read without words. "Frank Lloyd Wright said that the key to the universal is in the incidental," Darke said. "I reference all that. 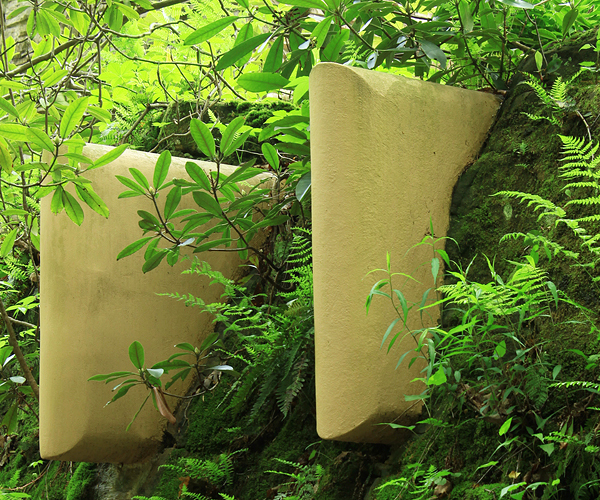 If you go looking for beds and borders at Fallingwater, you won't find them. But if you're looking for a truly immersive experience, you'll find that in shadow play, in snow and ice, and in moss patterns under frozen waterfalls." The book begins with Waggoner's introduction, and includes correspondence between Wright and the Kaufmans, never published before. "It sheds light on the family, and corrects some misperceptions about the house, too," Waggoner said. A special section offers a series of original, unpublished essays by members of the Kaufman family for an exhibit at the Museum of Modern Art that never went public. Also featured are essays by Wright scholars David G. De Long, Justin Gunther, Neil Levine, John M. Reynolds and Robert Silman. "These are all people I knew well - they're the ones that I wanted to write about the house," Waggoner said. "Having been around for the 50th anniversary, I was inspired to do this for the 75th - and Rizzoli had been after us for years to do something." 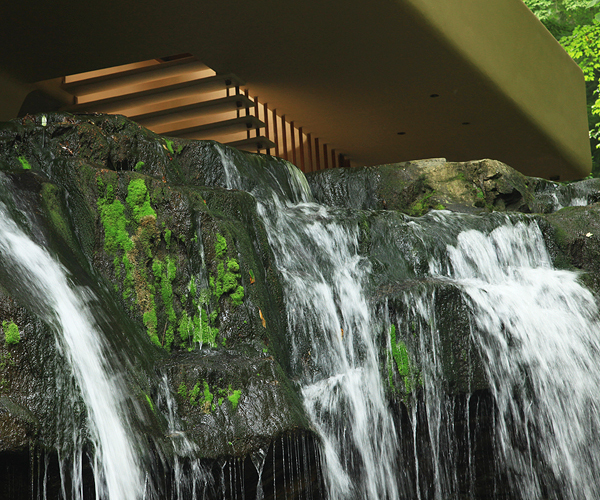 Levine's chapter deals with the significance of water and sound in Wright's design. "He said he designed it around the music of the stream for someone who liked to listen to the waterfall," Levine said. 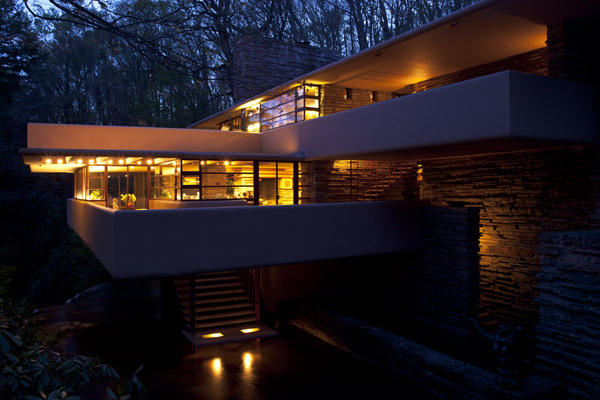 "He never said that about another building - it is peculiar to Fallingwater." And he used the sound of the water to enhance the visual experience of the building. "You see it in time through the analogy of hearing it," Levine said. One of the reasons that the Fallingwater experience is not easily explained is because of the building's integration with the water. The architect placed it over a stream because he wanted to incorporate its movement into the house, enabling its sound, smell and humidity to be part of the living room, flowing through it via a hatch in the floor that opens to water below. It was integral to his plan. "The plan is orthoganal - he was able to emphasize the diagonal from one corner to another," Levine said. "It's not laid out in his plan, but it's implied. The diagonal cuts across the square and aligns with the direction of the stream below. 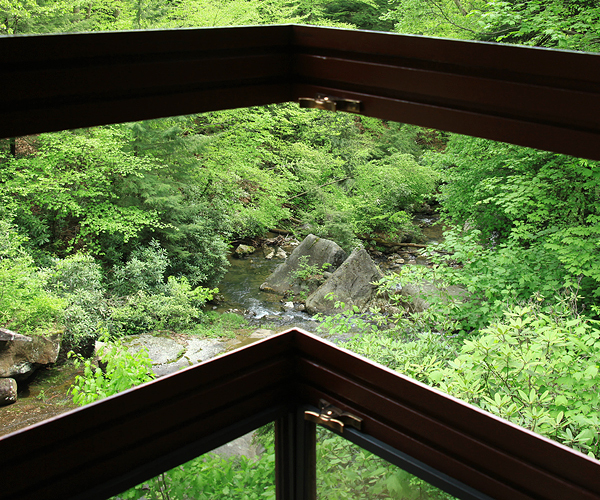 The line that crosses from fireplace to hatch aligns with the ledge of the falls over which the stream drops." The result is an experience that unites the residence simultaneously - in a visual, audible and temporal way. Fallingwater, a 12-inch by 12-inch volume, also reveals the planning process for Fallingwater's recent renovations, and how a seemingly unsolvable problem was overcome through modern engineering.